Haematuria is the presence of blood in the urine, either visible (seen by the naked eye) or non-visible (confirmed by urine dipstick or urine microscopy). It is never a normal finding and has a range of urological and non-urological causes, both malignant and benign, which commonly require further investigation. Symptomatic non-visible haematuria (s-NVH): haematuria (confirmed on urinalysis/microscopy) presents with associated symptoms, such as suprapubic pain or renal colic. Asymptomatic non-visible haematuria (a-NVH): haematuria (confirmed on urinalysis/microscopy) with no associated symptoms. Pseudohaematuria is red or brown urine that is not secondary to the presence of haemoglobin. There is a vast array of causes of haematuria; these can be stratified anatomically (Fig. 2). The most common causes include urinary tract infection (UTI), urothelial carcinoma, stone disease, adenocarcinoma of the prostate, and benign prostatic hypertrophy (BPH). Clarify any associated symptoms, such as any Lower Urinary Tract Symptoms (LUTS), fevers or rigors, suprapubic pain, flank pain, or weight loss, or recent trauma. Ensure to assess the drug history* and smoking status, due to the strong association with smoking and urological malignancies. Any exposure to industrial carcinogens (increased risk of bladder cancer) or recent foreign travel (increased risk of schistosomiasis from certain areas) should be clarified. An abdominal examination is essential, alongside potential digital rectal examination and / or examination of the external genitalia depending on the presentation. Urinalysis (urine dipstick testing) is usually the primary investigation in all settings*. The presence of nitrites and/or leukocytes on urinalysis may also indicate infection as a potential underlying cause. Baseline bloods (FBC, U&Es, and clotting) should be performed. Additionally, prostate specific antigen (PSA) testing may be indicated (after appropriate counselling) in patients where prostatic pathology is considered a possible cause of haematuria. In those with deranged renal function or suspected of a nephrological cause, urinary protein levels (spot albumin:creatinine ratio or protein:creatinine ratio) may be warranted. Patients should be referred for further investigations by a specialist service. Aged 60yrs with have unexplained non‑visible haematuria and either dysuria or a raised white cell count on a blood test. Patients with asymptomatic non-visible haematuria on two out of three tests should also be referred for further investigation. Referral to a nephrologist may be warranted in patients with a likely nephrological diagnosis, evidence of declining GFR, stage 4/stage 5 chronic kidney disease, proteinuria with haematuria, or those <40 years old with hypertension. Flexible cystoscopy is the gold standard investigation for assessing the lower urinary tract and should be performed in all cases that meet the criteria for further investigation where feasible (Fig. 3). This is often performed under local anaesthetic at a one-stop haematuria clinic. 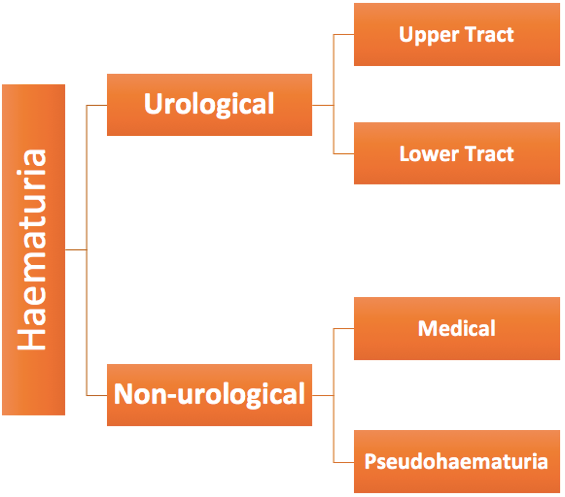 Whilst more commonly used in follow-up of patients with proven malignancy, some centres will also send urine cytology in the intial assessment for haematuria as a further adjunct assessment. Management is treatment of the underlying pathology. Approximately 20% of patients presenting with visible haematuria and 5% of patients presenting with non-visible haematuria are found to have an underlying malignancy. Which of the following medications is not a possible cause of haematuria? Which of the following is most likely to be the cause of terminal haematuria? Which of the following is not an investigation that would usually be indicated in the initial assessment for patients presenting with haematuria?